If you have ever been a teacher at any point in your life, you would have realized the importance of keeping your students engaged and on task at all times during the short period every day that you get to spend time teaching them. If you have just 30 minutes per day, you want to maximize the learning by having a structured lesson plan that moves smoothly from Introduction to New Material to Guided Practice and into Independent Practice. And if you have planned for the lecture properly, you would know how much time you want to spend at each stage doing each activity with the kids to ensure that the lesson is completed on time and doesn't spill over onto the next lecture. You may have a clock in your class, but having a countdown timer makes more sense in competitive and group activities. When the kids see the time ticking down, and they rush to try to finish the activity on time, it can give them an adrenalin rush and bring excitement to the activity. I am an engineer by profession and passion. So during as a fellow at Teach For India, I was always looking for ways to enhance teaching through use of technology. 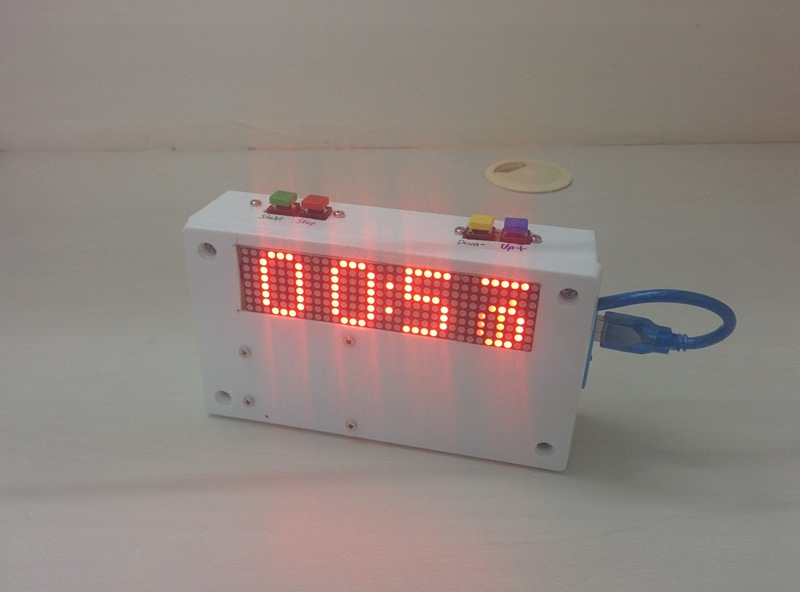 And so I made a small classroom timer based on Arduino. The first version had a dot matrix display and switches. Soon, I figured that adding WiFi and controlling the timer using a mobile phone would allow the time to be permanently installed above the blackboard in the classroom and avoid the need to touch the timer repeatedly and hence avoid any breakage due to accidentally dropping the timer. For the first version I used an Arduino UNO along with a 4 panels of 8x8 LED Matrix Displays. The left most 2 displays displayed the time remaining in minutes and the right most two displays were for the two digits which reported the seconds remaining. These display modules are powered by MAX7219 which allows you to control the displays using just 3 pins of the Arduino UNO. I connected the pins 2,3,4 of Arduino UNO R3 respectively to the DataIn_Pin, Clock_Pin, Load_Pin of the 4 module display. 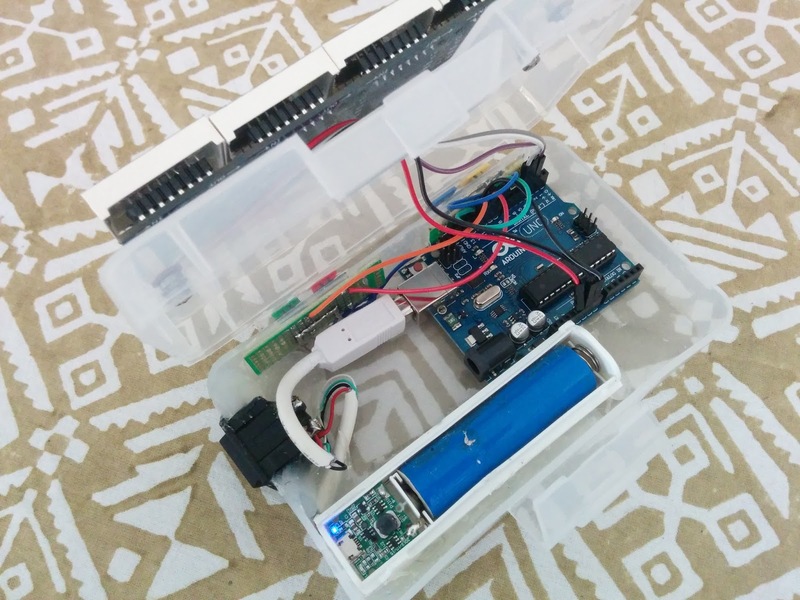 I powered the device using a portable power bank and put everything in a box. There are four switches connected to pins 8, 9, 10 and 11 of the Arduino which allows you to start / pause / stop the countdown as well as set the time that you want to countdown from in increments of 30 seconds. There are four switches. When you power up the timer, it starts counting down from 1:00 (1 minute). You can pause this by pressing the stop button once, and continue the countdown when you press start button. If you press stop twice, the timer is reset to the last set value (1:00 by default). When the timer is stopped (press stop twice), you can use the up and down buttons to set a new reload time. Once you have set the time, you can press start to start counting down. the switches are wired in active low mode. There are pullups enabled on the 4 points. I have also added external pullup resistors. 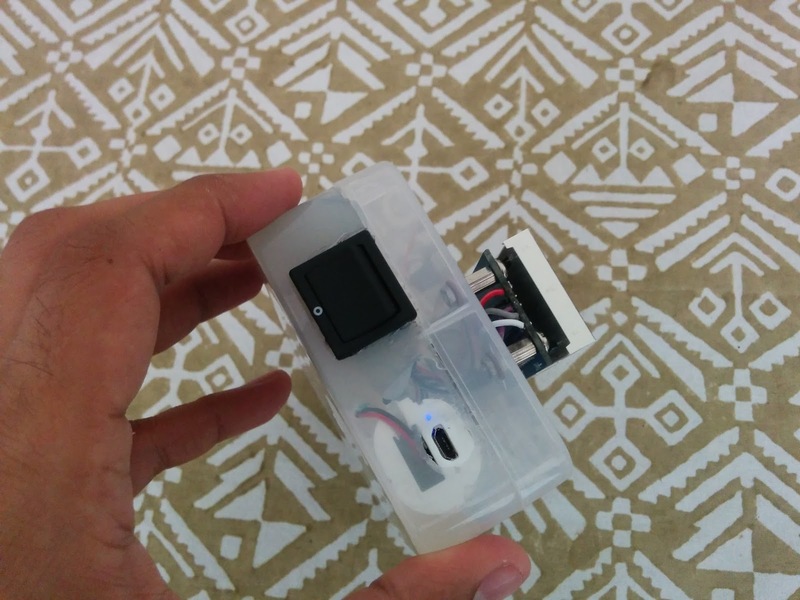 When the switches are presses, they short the corresponding arduino pin to ground. The first time I set about assembling the device, I used a plastic box. Soon after the plastic box broke and the power bank mal-functioned and so I got a switch box and transferred all the circuitry to the new box. the new box was sturdier and looked neater! TimerOne - for using a Timer Interrupt to update the display once every second. 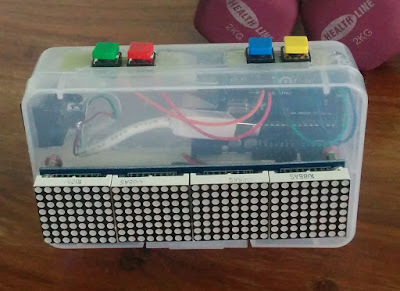 LedControl - This one is used for interfacing to MAX7219 displays. I had to modify this library because I used the modules upside down. PinChangeInt - Since the 4 buttons are connected to interrupt pins, I have sued Pin Change interrupts to respond to button presses. In case you want to use the code, download the 3 library folders to your Documents\Arduino\libraries folder, then download the .ino file and put it in a new folder on your computer. make sure this folder has the same name as the .ino file. double click on the .ino file and use Arduino to download the code onto your Arduino UNO R3.